NYAPRS Note: Newly released figures from the Centers for Disease Control and Prevention confirm that rates of death by suicide and drug overdose are among the highest ever in our history, especially among Native Americans and white people, in contrast with those in Britain, Russia, India, China and Western Europe. See the CDC report below. Suicide is rare, but it’s increasing in America. The suicide rate is the highest it’s been in decades, the latest warning sign of a worsening public health issue in America that needs far more attention. According to a new report by the Centers for Disease Control and Prevention, 47,000 Americans died by suicide in 2017. Put another way, the suicide rate was 14 people in every 100,000 — up 33 percent from 10.5 people per 100,000 in 1999. The suicide rate is at a 50-year peak, according to the AP. 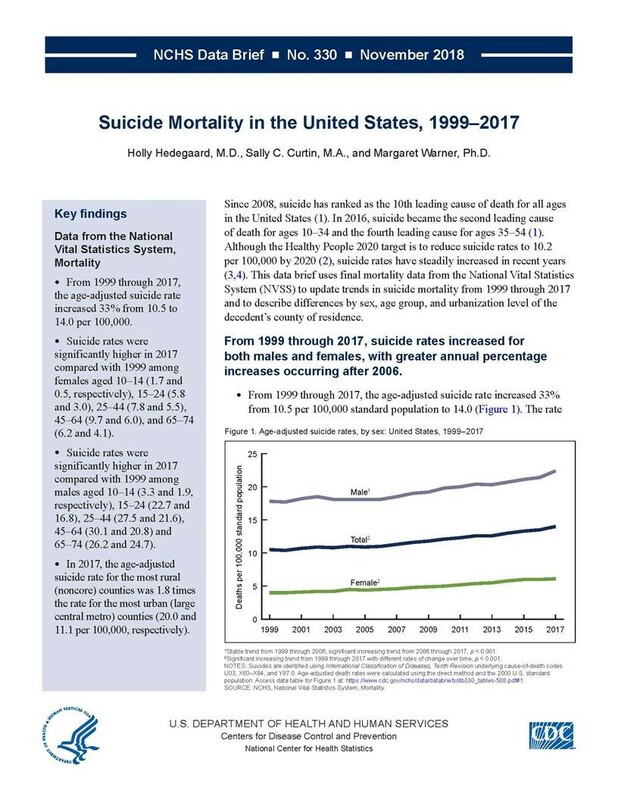 The new data shows that there were 2,000 more deaths from suicide last year than in 2016, the year when suicide became the second-leading cause of death for Americans between the ages of 10 and 34 and the fourth-leading cause for middle-aged Americans. The increase is in part responsible for another drop in life expectancy this year. Americans are now living an average of just over 78 years and six months on average, according to the report. The average life expectancy has dropped each year since 2016. Suicide is on the rise, but that doesn’t mean it’s a common occurrence. Because we are very sensitive to information about what’s normal, it’s important to note: While suicide is the 10th leading cause of death, it’s still rare, and it ought to be rarer. 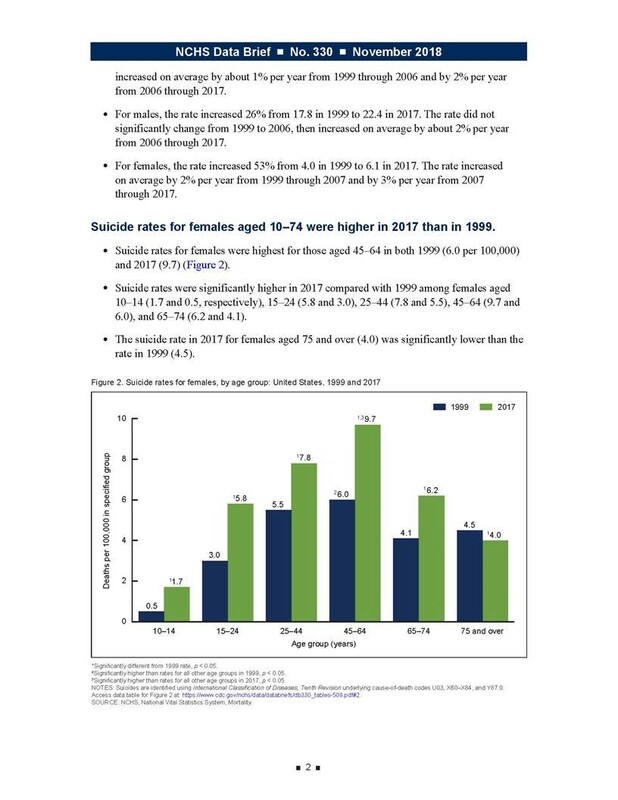 There’s much not yet understood about the rise in suicides, but one finding of the CDC’s previous research was that it’s not necessarily linked to mental health: More than half of the people who died by suicide in 2016 had no known mental health problems. Instead, as Vox’s Julia Belluz reported this summer following the death of beloved chef and author Anthony Bourdain, researchers have found that the majority of suicides are related to problems with relationships, substance use, health, jobs or finances. Researchers have explained the decline, in part, by an increase in “deaths of despair”: suicides, alcoholism, and drug overdoses, particularly from opioid painkillers, are a rising problem for midlife white people. Experts say suicide is largely preventable. Research has shown, for instance, that states with higher rates of gun ownership also have higher rates of suicide, suggesting that tighter gun laws could lower the rate of suicide. The CDC also suggested that an emphasis on housing and financial policies and “promoting social connectedness” could prevent suicide. Suicide is a frustrating, stubborn tragedy, and one that’s growing more common. But it’s a trend that can be changed. It’s increasingly important to recognize the warning signs, and be aware of common risk factors, like a family history of suicide, a history of mental health issues and recent losses or personal difficulties. Here’s how to help. The International Association for Suicide Prevention lists a number of suicide hotlines by country. Click here to find them.